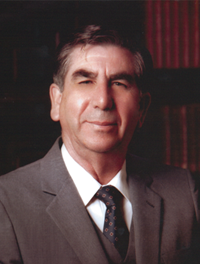 Manuel J. Vizcarra (1924 – 2003) was the eighth Bishop President of the Apostolic Assembly, serving from 1986 to 1994. He shepherded over half a dozen churches throughout his lifetime and his colleagues recognized his leadership when he was elected Bishop Supervisor of the historic Northern California District in 1966. An ecclesial visionary, brother Vizcarra rose through the ministerial ranks being first elected in 1974 to be Secretary of Christian Education. After that he was elected to be General Secretary in 1978 and then served as Bishop Vice President for four years starting in 1982. He holds the distinction of being the first Bishop President of the Apostolic Assembly in Mexico. His wife sister Martha, a true ideal helper, donated this Special Collection to the Historical Archives in 2013.